The Breakdown: How Can the Democrats Close the Enthusiasm Gap? Ari Berman and Chris Hayes ask why Republicans are fired up and ready to go while Democrats are just burnt out? Ari Berman and Chris Hayes ask why Republicans are fired up and ready to go and Democrats are just burnt out? With less than a month until the midterm general elections, the phrase “enthusiasm gap” has become short-hand for the Democratic party’s inability to muster the same fervor and urgency in their constituency that conservative and Tea Party activists have been able to ignite for the Republican party’s base. But why is one party fired up and ready to go and the other base is just burnt out? Furthermore, what happened to the grassroots movement that swept Obama to office in 2008, and why is it faltering in 2010? 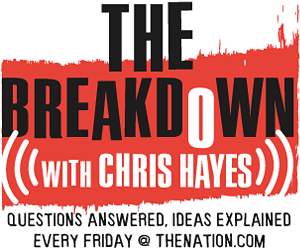 DC Editor Chris Hayes and The Nation‘s Ari Berman, author of Herding Donkeys: The Fight to Rebuild the Democratic Party and Reshape American Politics, answer these questions and more on this week’s edition of The Breakdown. Herding Donkeys: The Fight to Rebuild the Democratic Party and Reshape American Politics by Ari Berman. More stories by Ari Berman from The Nation. The New York Times‘s FiveThirtyEight blog on the enthusiasm gap.